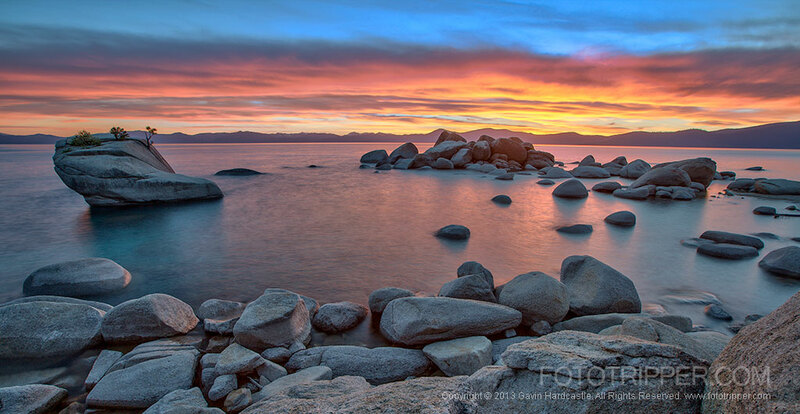 For photographers, Lake Tahoe in California/Nevada should earn a place on your bucket list. 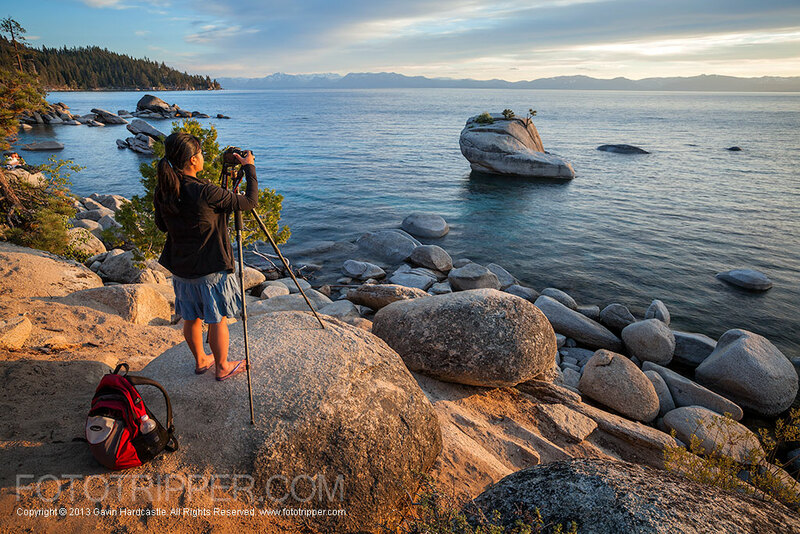 It’s pristine waters, epic rock formations and snow capped mountain backdrop makes for amazing images, so here are my Lake Tahoe photo tips from a recent visit. We only had three nights in Lake Tahoe so we had to prioritize and devote all our time to one location. Obviously it had to be what is commonly known as ‘Bonsai Rock’, a small boulder close to the shore line that has tiny little trees growing from the top against all odds. That being said we saw lots of other spots worthy of photography but the weather wasn’t kind to us. We were headed from Vegas on our way home to BC so we had an epic 9 hr drive to Get to Lake Tahoe. I’m guessing most people will be coming from Reno or Sacramento. Take the 580 South then take a right on to the 431 all the way to Lake Tahoe. It’s a pretty awesome drive with lots of switchbacks. Take the I 80 North East all the way to Truckee and then go right on 89 to Tahoe City. If your destination is the Kings Beach area, stay on I 80 and take the 267 down to Kings Beach. It’s actually pretty easy to find. 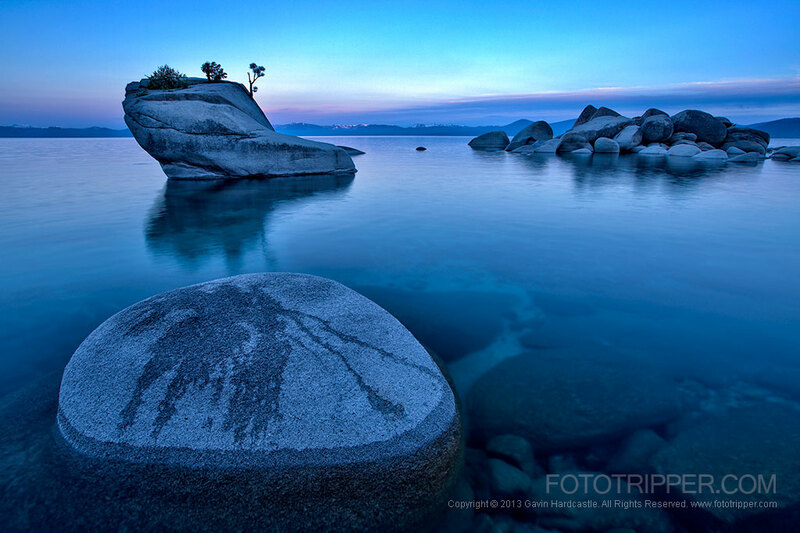 Bonsai Rock is located in the Nevada side of Lake Tahoe and It’s best to approach it from the North-East corner of the lake. Leave Incline Village and drive South towards Sand Harbor State Park. Pass Sand Harbor and continue for about 2 miles and look for a couple of pull outs on the right. You’ll know you’ve got the right ones if they are immediately after an illegal pullout space on the opposite side which has a warning sign. From the parking spot you can see down to the beach. It’s a steep but very short hike on lots of loose sand and rocks so don’t hike down in flip flops like I did. There are three unofficial trails from the road down to the beach, take your pick, it’ll be 5 minutes max. Download the .KML Map file for exact GPS position (63k). You’ll get better photos if you brave the water and get your feet wet. We were there in May and the water wasn’t cold. I expect it’ll be a shocker in the winter. Pack some flip flops in your camera bag so can wear them in the water for some grip on those rocks. A polarizer is a must if you want to cut through those water reflections. Bring a powerful ND filter. The water was actually pretty choppy due to lots of wind and I was hoping for a flat, mirror like surface. Sadly I didn’t have my ND filter so there’s still a lot of motion in the water on my sunset shots. The ND would also have allowed me to shoot longer exposures in brighter light which is always an interesting effect. Go in summer for low tide shots that expose more of the white sand and smaller rocks. This will also give you more foreground options and give ‘Bonsai Rock’ a little more height. Go in winter and get those amazing shots that have snow on the rocks and mountains. If you ski as well you’ll be in heaven. 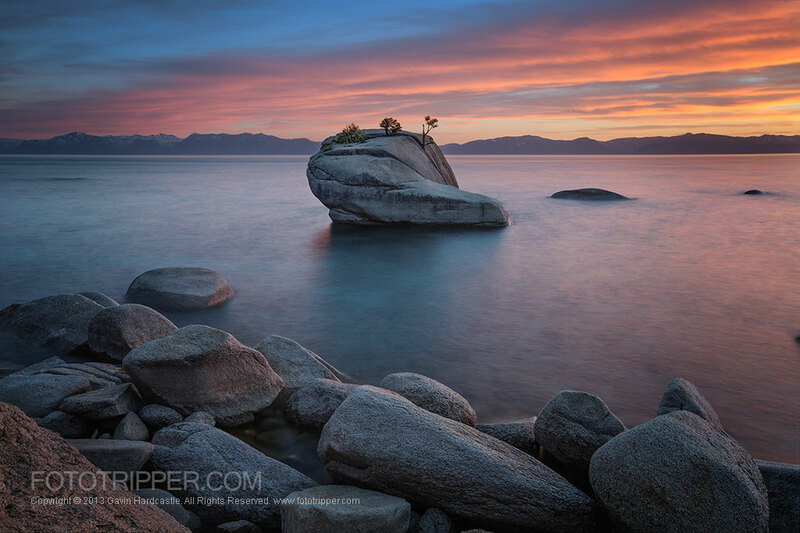 Get Low – By getting a low angle ‘Bonsai Rock’ will seem larger and cut into the sky instead of clashing with the background mountains on the same level (like below). Compare the first shot on this page with the second and you’ll see what I mean. There is lots of choice for accommodation at Lake Tahoe. We stayed at the Parkside Inn at Incline and it was OK. My main reason for choosing it was because it was so close to Bonsai Rock. It’s also really close to lots of restaurants. The rooms were rustic but spacious. Lots of dining choices await you at both Incline Village and Tahoe City. You’ll also find plenty of eateries at Kings Beach so it really depends on what you like. We had decent ravioli at Tamaato’s in Incline Village. As always my favourite beer in California and Nevada is the Sierra Nevada Pale Ale. 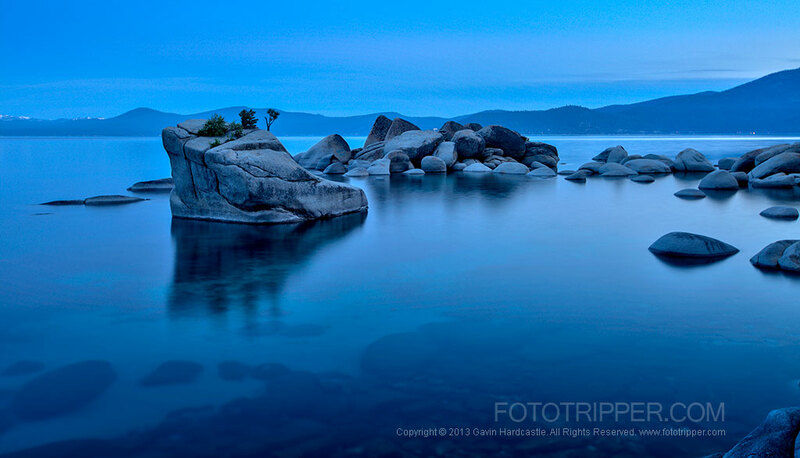 Let me know about other great photography locations at Lake Tahoe and share your shots of this amazing place. Thank you for the images! I am looking for photo tips before I leave for my trip in 2 weeks. What grade ND filter would you recommend? Personally I’d opt for a stronger ND so that you can benefit from its effects in brighter light. Something like a 0.9 would be my starting point. It all depends on your shooting style and what you hope to achieve. I was looking for scenic locations near Lake Tahoe and came across your site. Wow Lots of wonderful information here. I like the detailed location descriptions. They are very helpful along with you amazing captures.